MA in Architecture from Tehran University. Worked as designer & consultant at Iran Handicrafts Center. Worked as Architect at Iran Air. General Contractor & design build from 1981 to 1999. Structural steel detailer from 1999 to present. 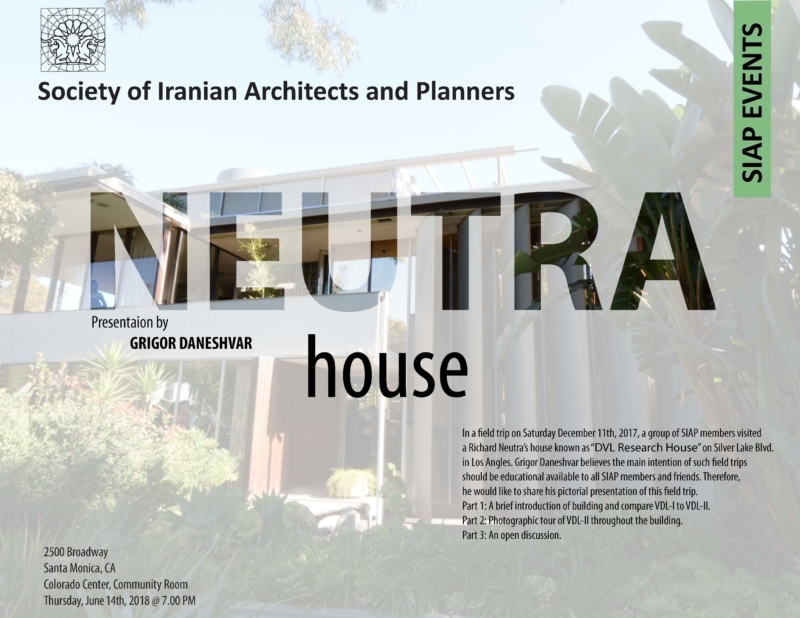 In a field trip on Saturday December 11th, 2017, a group of SIAP members visited a Richard Nuetra’s house known as “DVL Research House” on Silver Lake Blvd. in Los Angles. Grigor Daneshvar believes the main intention of such field trips should be educational available to all SIAP members and friends. Therefore, he would like to share his pictorial presentation of this field trip. The presentation will be in three parts. Part 1: A brief introduction of building and compare VDL-I to VDL-II. Part 2: Photographic tour of VDL-II throughout the building. Part 3: An open discussion.